The average cost of raising a child has been estimated at $233,610, so you’ll need to take every chance you get to save money. One place where you might be uneasy about cutting costs is with regards to your child’s safety. However, with a few smart hacks, childproofing your home can be a cheap and easy process. That’s not to say that you shouldn’t invest in professional quality products where necessary. Sometimes though, some old object that you never use could help to prevent an injury and give you peace of mind that your child is safe. 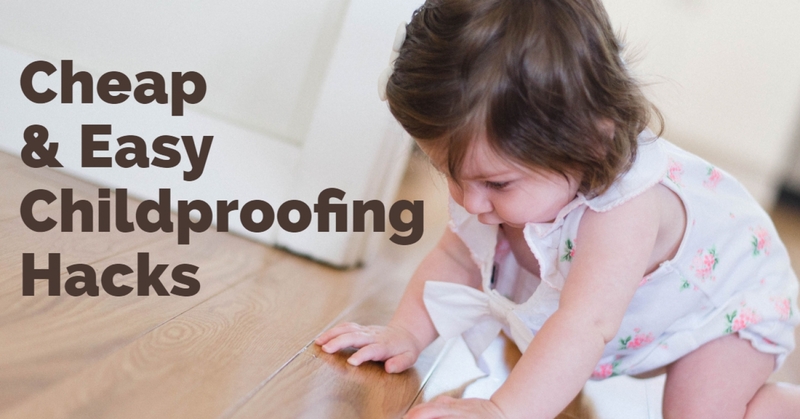 Read on for some top childproofing hacks. Some doors, such as on the oven or inside of the car, should use professional child locks meant for the job. However, you shouldn’t think that you need this on every door in the house. For instance, your wardrobe probably only contains a few soft clothes. Not obviously harmful to a child, but also not something you’d want them to access. Simply attach a rubber band over the handles and their access will be denied. Do you remember those long soft floaty things you had in the pool as a child? They could help prevent an injury in the home. Known as pool noodles, these can be placed on sharp objects, such as the side of a table, wall or door. When your little one is tearing around the house, they’ll have softer surfaces to crash into. A tennis ball also works well on table corners. Since 1989, eight children have been killed by recalled dressers and drawers, with many more injured. When a bottom drawer on a chest is opened, the center of gravity shifts such that tipping is likely. Your child probably sees a set of open drawers as a ladder to be climbed. Fortunately, this scenario is easy enough to avoid. Most furniture comes with a wall fastening, but if not, you can simply nail it to the wall. A few nails in the back of the wardrobe is enough to make it impossible to tip over. Another childproofing hack that costs nothing is removing the knobs, switches, and buttons that you don’t want your child to touch. For instance, the knobs on the stove can be easily removed when not in use and placed in an out of reach cupboard. Your little one will then be unable to burn themselves or start a fire. You can also remove the knobs on heaters, tape up switches, or even remove door handles if you want to prevent your child from using any of these objects. As a parent, your child’s safety is likely your top priority. However, don’t think that you have to spend a large amount of time and money to childproof your home. These simple hacks cost next to nothing and work well in preventing injury. This allows your child to play and be curious without causing you any worry as a parent.